Atop Bird Rock at the Cape St Mary's Ecological Reserve in Newfoundland, Canada is where you will find more than 24,000 Northern Gannets breeding, nesting and feeding. The Northern Gannet in this picture, peacefully flies past the sides of Bird Rock after taking flight from above either to enjoy the moment or to look for food. Northern Gannets, Morus bassanus, at Bird Rock at the Cape St Mary's Ecological Reserve, Cape St Mary's, also known as The Cape, Highway 100, The Cape Shore, Placentia Bay, Avalon Peninsula, Newfoundland, Newfoundland Labrador, Canada. 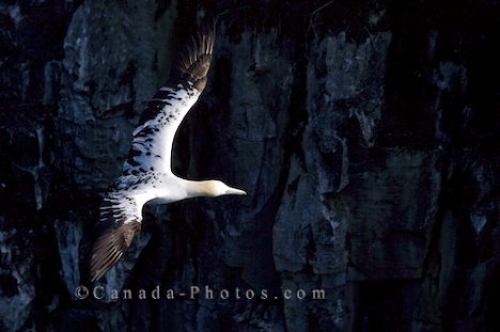 Picture of a Northern Gannet soaring near Bird Rock at the Cape St Mary's Ecological Reserve in Newfoundland, Canada.